Rufus & Coco 2in1 Bright White Wash is a professionally formulated whitening shampoo for white and light coloured coats, with a conditioner to soften and add shine. It gently removes stains and adds shine without bleach or harsh chemicals. First, get your little mate all wet with warm water. Now apply Rufus & Coco's Bright White Wash to a few different areas of the coat, and massage it in to get a really good lather going. Simply rinse and towel or chamois dry. Do this whenever they need a wash, and use Rufus & Coco 4in1 Pamper Spray after or between washes for the very best results! Optical Brighteners – These dyes absorb light in the UV spectrum and re-emit it in the blue portion of the visible spectrum. Surfaces treated with optical brighteners emit more visible light than that which shines on it, making it appear brighter. The blue light emitted by the brightener compensates for the diminishing blue of the treated material and changes the hue away from yellow or brown toward white. Panthenol (Pro Vitamin B5) – This plant-derived ingredient acts as a penetrating moisturiser. It coats the hair and seals its surface, lubricates follicles, aids de-tangling, provides volume and makes strands appear shiny. Cocamidopropyl betaine – Derived from coconut oil, this mildly antiseptic compound also prevents static, minimizing fly-away. Hydrolyzed Wheat Protein Helps to strengthen and hydrate hair while increasing manageability gloss, body and lustre. Cocodimonium Hydroxypropyl Hydrolyzed Wheat Protein – Vegetable derived conditioning and anti-static agent, helps prevent flyaway and tangling. Hypoallergenic fragrance – Where many fragrances (including those with natural ingredients) may cause allergic reactions in sensitive pets, our specially formulated fresh scent is allergen free and designed by perfumers with the concept of the Australian backyard in mind, so it is far less likely to cause a reaction. Water, Sodium Cocoyl Glycinate, Hydrolysed Wheat Protein and Hydrolysed Wheat Starch Complex, Cocamidopropyl Betaine, Lauramide DEA, d-Panthenol, Glycerine, Citric Acid, Brightening Agent, Perfume, Preservative. It is also what Rufus & Coco does not contain that makes it better! Sodium Lauryl Sulfate (SLS): Sulfate is a harsh (caustic) detergent that can damage the outer layer of the skin causing dryness, roughness, scaliness, fissuring, loss of flexibility and reduction of the barrier functions of normal healthy skin. SLS is an ester of Sulphuric Acid. Parabens: The use of mixtures of parabens allows the use of lower levels of other ingredients while increasing preservative activity. Parabens are esters of p-Hydroxybenzoic Acid. Ethyoxylates: These non-ionic surfactants or detergents may be toxic to animals, ecosystems and humans, and can increase the diffusion of other environmental contaminants. A: Using soap in an animal's wash will affect their skin as the acid layer of their skin will be disrupted. This can create an environment where bacteria, parasites, and viruses can breed out of control! Unknowingly, many pet owners may repeat washing their animals because of the smell caused by a proliferation of bacteria, making the problem worse as the skin's acid layer (pH level) becomes more imbalanced. Additionally, if the shampoo makes the skin feel dry, your animal will scratch at its skin, creating abrasions for bacteria to invade. It quickly becomes a vicious cycle. None of the Rufus & Coco washes (shampoos) contain soap. Rufus & Coco products use a natural base and formulation specifically designed to the average pH of pets. Consider that the normal range of skin pH levels for humans is 5.2 to 6.2, which means it tends to be on the acidic side, whereas the pH levels for dogs and cats range from 5.5 to 7.5, tending toward a more alkaline concentration. Hence we never recommend using human shampoos on pets and we eliminate the soap all together in our washes. Many humans choose soap free alternatives too for the same reason! Rufus & Coco washes also contain a hypoallergenic fresh scent. "My coat had gone to the dogs! I would dream about my youth when I was a sparkling white pup. But now my dreams are a reality with Rufus & Coco Bright White Wash - my coat is brighter and all those marks and stains have disappeared. 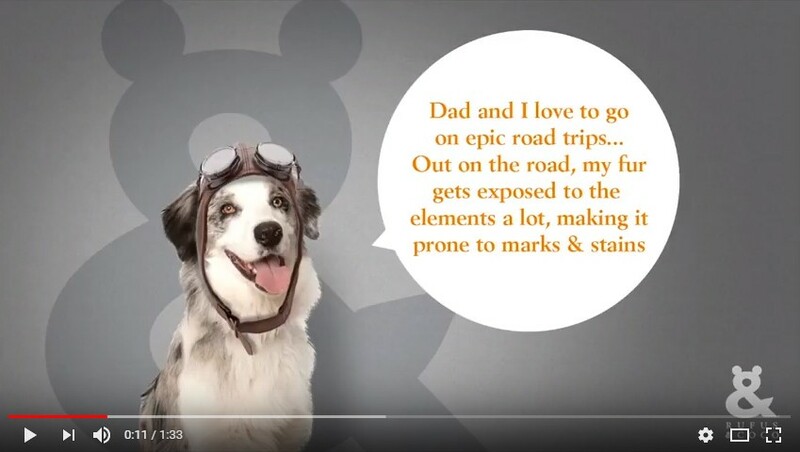 Now I walk down the street with my head held high.... "
Essentials to making a getaway with your pet furrific!